This bundle contains 1 vial each of O-Glycosidase (NEB #P0733S) and a2-3,6,8 Neuraminidase (NEB #P0720S), which can be used simultaneously for the removal of terminal sialic acid residues and core 1 and core 3 O-glycans. 1 set of this bundle includes 2,000,000 units of O-Glycosidase and 2,000 units of Neuraminidase. O-Glycosidase, also known as Endo-α-N-Acetylgalactosaminidase, catalyzes the removal of Core 1 and Core 3 O-linked disaccharides from glycoproteins. O-Glycosidase is cloned from Enterococcus faecalis and expressed in E.coli (1). Neuraminidase is cloned from Clostridium perfringens (2) and overexpressed in E. coli (3). One unit of O-Glycosidase is defined as the amount of enzyme required to remove 0.68 nmol of O-linked disaccharide from 5 mg of Neuraminidase digested, non-denatured fetuin in 1 hour at 37°C in a total reaction volume of 100 µl (1 unit of both O-Glycosidase and PNGase F will remove equivalent molar amounts of O-linked disaccharides and N-linked oligosaccharides, respectively). Two fold serial dilutions of O-Glycosidase are added to a reaction mixture of 5 mg of Neuraminidase digested fetuin with 1X GlycoBuffer 2. The reaction is then incubated at 37°C for 1 hour. 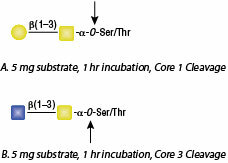 O-linked disaccharide carbohydrates are determined by Morgan and Elson Assay (4). Note: Under denaturing conditions the enzyme activity is increased two-fold. This observation is substrate dependent. One unit of Neuraminidase is defined as the amount of enzyme required to cleave > 95% of the terminal α-Neu5Ac from 1 nmol Neu5Acα2-3Galβ1-3GlcNAcβ1-3Galβ1-4Glc-7-amino-4-methyl-coumarin (AMC), in 5 minutes at 37°C in a total reaction volume of 10 µl. Since O-Glycosidase is inhibited by SDS, it is essential to have NP-40 in the reaction mixture. It is not known why this non-ionic detergent counteracts the SDS inhibition at the present time. Double digest with Endo H must have NP-40 present (NP-40 does not inhibit Endo H). Koutsioulis, D., Landry, D. and Guthrie, E.P. (2008). Glycobiology. 18, 799-805. Roggentin, P. et al. (1988). FEBS Lett. 238, 31-34. Guan, C. unpublished observations. New England Biolabs. Morgan, W.T.J. and Elson, L.A. (1934). Biochem. J. 28, 988-995. What are the typical reaction conditions for O-Glycosidase? How much O-Glycosidase should I use to remove my carbohydrate under native conditions? How do I inhibit O-Glycosidase? What is a good positive control for O-Glycosidase? I tried using O-Glycosidase on my glycoprotein and didn't see removal of the carbohydrate. What could be the problem?